Seated in Santa Monica, California’s Pacific Palisades, this house was advantageously planned to meet the restricted policy of the area. It also designed to promote safety and preserve the said landscape. The landscape of the area is one of the most important factors in selecting a house spot. Also it is made to take advantage of its volume considering its environmental effect. This house is called the Hill House and it has three floors. It is built to create a more spacious and a friendly interior area. The central floor is where you can see the living room, kitchen and the dining room. It has a semi-private loft space above the main floor. The bedrooms are located in the ground floor. 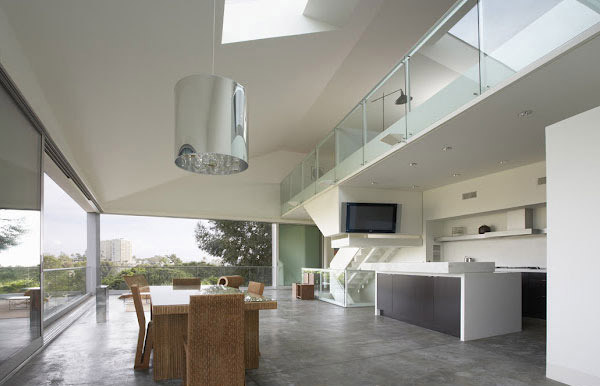 The highlights of this house are sliding glass doors on the main floor and the skylight aperture. It is made of high quality materials such as concrete, steel and timber. Also it is covered with a special material that was colored to match the eucalyptus bark that is found in the place. Now, I am pretty sure that you are so excited to see the pictures that will justify my description of this Hill House. You may now look at the pictures below to fully see its features. Looking at the front of this house can make you think of the secrets that can be revealed from the inside. 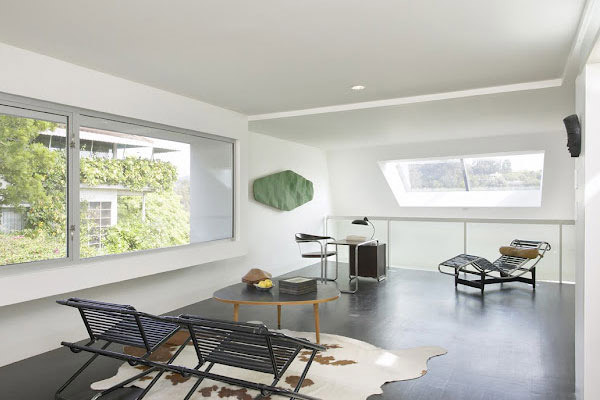 The role of the skylights in both the flat and sloped roofs added the typical distinction between the roof and its wall. The foundation of this house is nine 35-foot deep with the concrete piles. 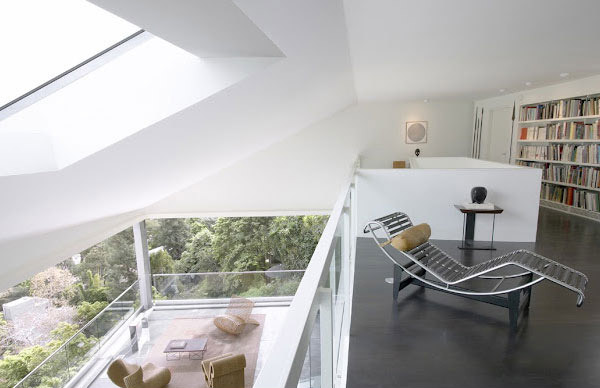 The lines and shape of this house complements with the arrangements of the chairs. Here is a glimpse of the simple dining room and kitchen. The panoramic view is straightly seen from the dining room to the kitchen room. 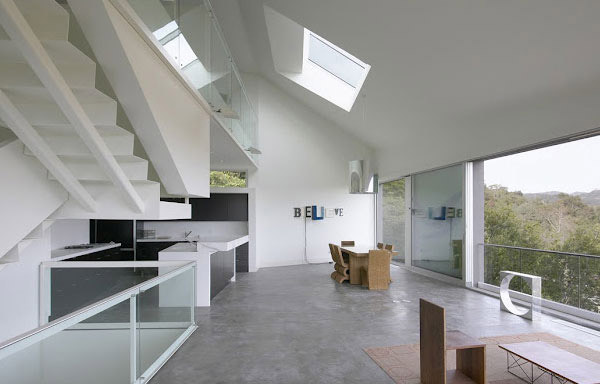 You can see the area from the living room to the loft of this Hill House. 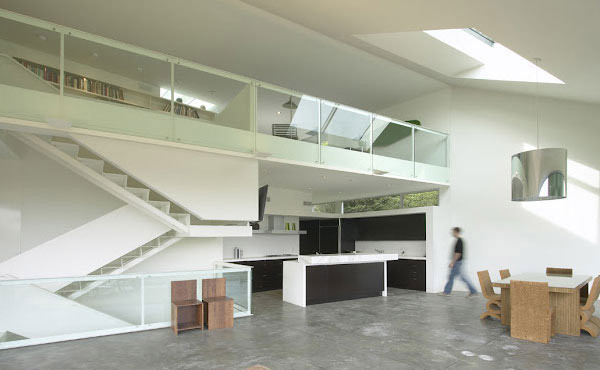 You may feel the freedom in exploring the different spots in this wide space of the house. Here is the loft where you can see their collections of reading materials that are perfectly arranged in these shelves. You are now looking at the simple bedroom just found below the main floor. Here is the sliding glass door in the main floor that emphasize the uniqueness of this house. 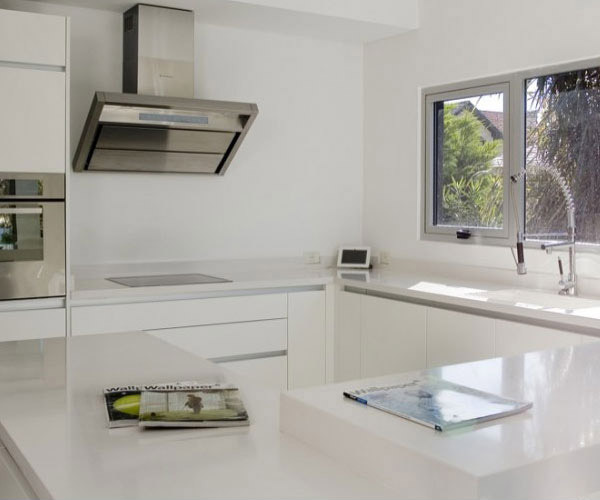 The combination of white and silver color in this kitchen area stressed the cleanliness and neatness of this space. For sure you can unwind here when you can see the landscape from the exterior. The first rate furniture are excellently placed in its respective area. This is the ideal area where you can sit down and read your favorite book. 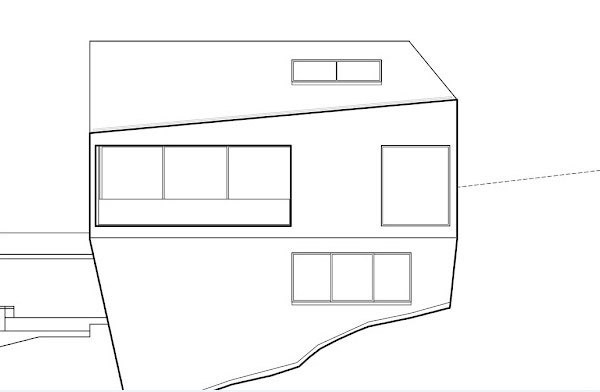 This is the Sketch Plan of the Hill House. 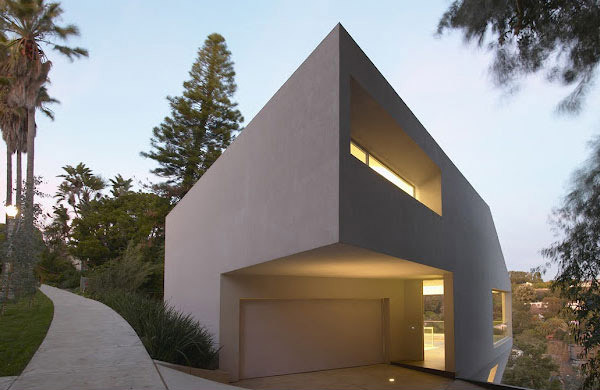 Now we may say that the incredible shape of this house contains a very strong minimalist concept. 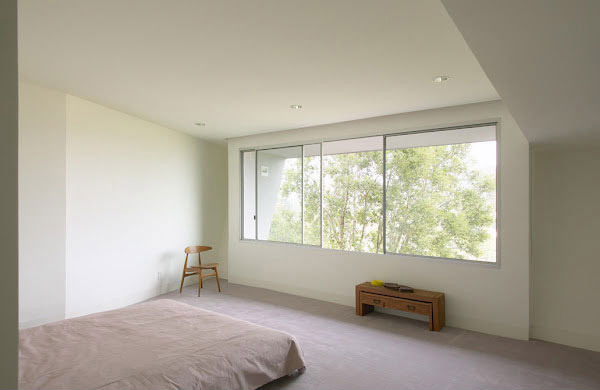 The design of this house provides an opportunity to see the green view from the different parts of the house. 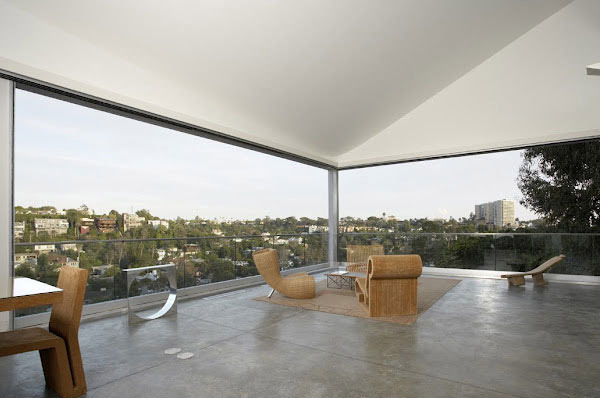 Undeniably we are truly impressed on this Hill House which is made by Johnston Marklee. The designer is very creative and intelligent to come up with this kind of house. You have witnessed how the designers wittingly planned where to put the different rooms in its respective place. 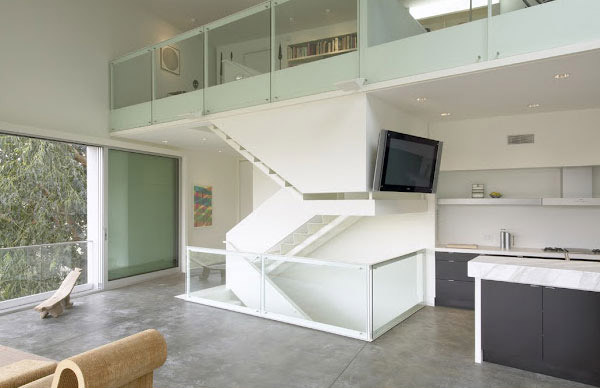 The private areas of this house are the loft which is a studio and a bathroom in the basement. 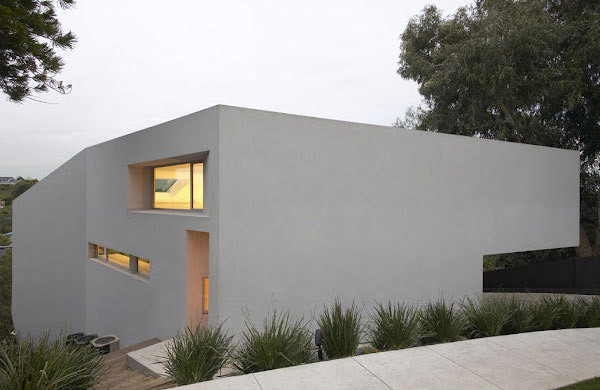 You can also see some California grasses that seem to form a blanket that covers the slope in the entire house. Thus we can say that if and only if we would have house design like this, our everyday life will be more peaceful and calm. Are you inspired to have a house design like this?